Not to be confused with Kingdom of the Netherlands. 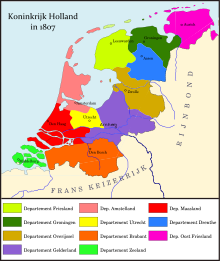 The Kingdom of Holland was a country that existed from 1806 to 1810. It was in Central and North Netherlands and East Friesland in Germany. It was a puppet state created by France. The king of Holland was Louis Bonaparte. This page was last changed on 7 January 2017, at 10:00.